Vegetable gardening is a healthy hobby. There is nothing better or more nutritious than home grown vegetables. Ensuring a bountiful harvest takes some planning and preparation prior to planting. Tips on planting a vegetable garden are useful not only for novice gardeners but also for those who have been gardening for some time. Before you begin actually putting your seeds into the ground, there are a few things you should do in order to prepare the area and soil. Select the best location in your landscape for your vegetable garden. Vegetables do not require a large amount of land and can be grown in containers, on balconies or in yard beds. A good harvest is possible no matter where you plant your vegetable garden, as long as it gets plenty of sun. Consider building a raised bed for growing vegetables. Raised beds have many advantages over tilling up a garden space. Raised beds are easy to build or can be purchased as a kit of easy assembly. The advantage of a raised be over a tilled bed is mainly in the soil quality. Gardening in a raised bed allows you to control soil quality, water drainage and requires less physical labor than tilled beds. 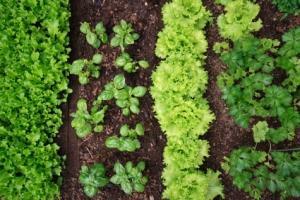 Fill your garden bed with high-quality organic matter. Organic compost added to the soil gives vegetables a tremendous nutrient boost. Avoid using chemically based fertilizers that will damage your vegetables and are unhealthy. Once you've prepared your garden and and soil, it's time to start planting your vegetables. Timing is extremely critical when planting a vegetable garden. Each individual vegetable has a preferred planting time relative to many factors including cold tolerance, heat tolerance and total maturation time. Make a planting chart that outlines the best time to plant and highlight the maturation date for each vegetable. Purchase seeds based on your earlier garden plan. Depending on where you live, starting seeds indoors in seed trays help to push the season along a little bit. Purchase organic or heirloom seeds when possible for the highest quality. The easiest plants to grow from seed include lettuce, peas, cucumbers, peppers and tomatoes. Lettuce: Sow 4-6 weeks before the last frost, directly into the garden. Moisten the soil and plant right on top of the dirt. Cover the seeds lightly with soil and keep them moist. Peas: Plant in early spring directly into the garden. Sow the seeds 1-inch deep and 3-inches apart. Water the seeds thoroughly and provide a trellis as they grow. Cucumbers: These warm season seeds are large and easy to plant. Plant the seeds in late spring or early summer directly into the garden. Sow the seeds 1-inch deep and keep them moist until they sprout. Peppers: Start peppers indoors 4-6 weeks before the last frost to get a jump start on the season. Plant in a high-quality plant starter mix. Place 3-5 seeds on top of slightly wet soil and cover with about 1/4 inch of soil. Keep the seeds moist and place them in a sunny window or under a grow light. Do not transplant until nightime temperatures are 55-degrees or higher. Tomatoes: Start tomatoes indoors in the same fashion as you do the peppers. Depending on the length of your growing season, it is possible to plant several times in one season for a greater yield. Some vegetables take a long time to mature while others ripen for harvest quickly. Plan you garden carefully so that you can continue to plant after each harvest. This is an especially good technique for those with a small garden space. Consider planting a smaller crop of the same vegetable continuously for a continual harvest throughout the season. Avoid disease and maintain soil nutrients by rotating crops during the growing season. Because vegetables have different nutrient requirements, it is best not to plant them in the same place all the time. Rotation is also a form of organic pest control. Just like some people get along better with certain people, some plants get along better with certain plants. To maximize the growing potential of planted vegetables, it is essential to understand which plants do best together. For example, potatoes do not mix well with squash or tomatoes and beans are not a good vegetable to mix with onions. A newly planted vegetable garden requires plenty of water to get started. Setting up a drip irrigation system is an easy way to ensure that your new vegetable garden will not go thirsty. 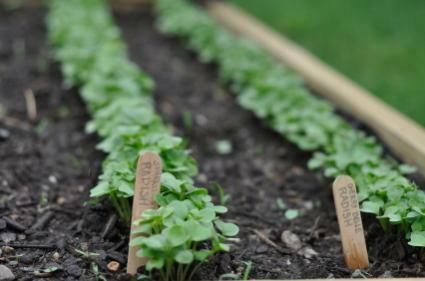 Although these tips on planting a vegetable garden provide essential information, it is still important to realize that a thriving garden requires daily attention. Plan to spend time each day throughout the growing season caring for your vegetable garden. It will give back with a rich and nutritious harvest.